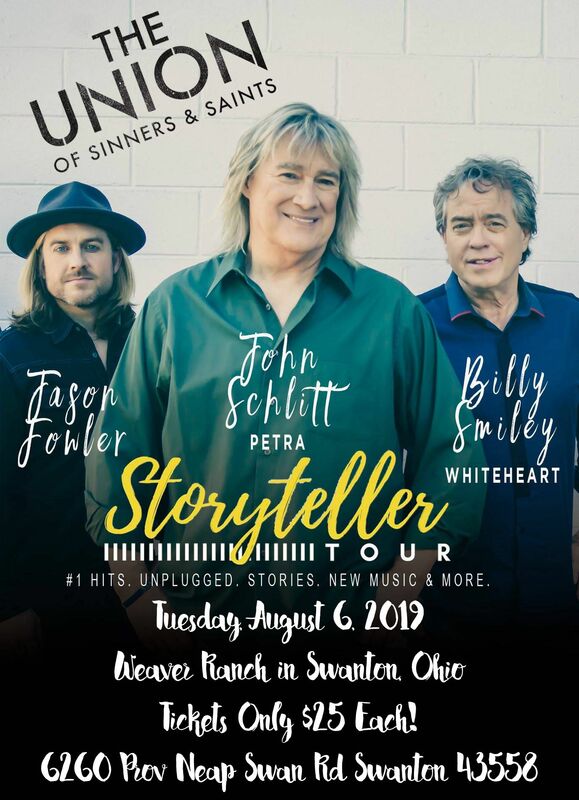 The Weaver Family and the W2Crew are excited to welcome The Union of Sinners and Saints StoryTeller Tour to the Weaver Ranch Barn on August 6, 2019 at 7 PM. An extremely limited number of tickets will be available for only $25 each. This special acoustic concert brings together John W. Schlitt of Petra, Billy Smiley of Whiteheart and new artist Jason Fowler. The set list includes classic songs from Petra, Whiteheart and new music from The Union of Sinners and Saints. This is a momentous year! It is the 30th Anniversary of Petra Praise! and Whiteheart's Freedom. What a wonderful time to hear the band sing and tell the stories behind some of the greatest songs in Christian music history. Come and celebrate timeless and historic Christian music! The Stories are amazing. The Songs speak for themselves. The camaraderie between John W. Schlitt, Billy Smiley, and Jason Fowler is refreshing and entertaining! The concert will be held at the Weaver Ranch barn in Swanton, Ohio. If there is inclement weather, the concert will be moved to Delta Church of Christ in Delta, Ohio. All tickets are general admission.